Five-time world champion Raymond van Barneveld says he will continue playing for the rest of 2019, a day after announcing his immediate retirement. The 51-year-old Dutchman had originally planned to quit after the next PDC World Championship in December. His early elimination from the Premier League prompted him to say on Thursday he was bringing forward his retirement. "I realise that I should not speak out like that when I feel such raw emotion," said Van Barneveld on Friday. Van Barneveld, who has slipped to 30th in the Professional Darts Corporation's Order of Merit, said he has experienced a "rollercoaster of emotions" in recent months following the break-up of his marriage. He won only one of his nine Premier League matches and, in a double-header in Rotterdam, lost 7-1 on consecutive nights to Daryl Gurney and world number one Michael van Gerwen. Speaking to Sky Sports after his defeat by Van Gerwen on Thursday, Van Barneveld said: "I've made a decision, I'm done now. "I don't want the pain anymore. It's good to see that everyone loves you but they don't have one single clue what I'm going through." However, a later message from his manager posted on Van Barneveld's Twitter page said he would take some time to "clear the mind and think about the future". In Friday's statement, Van Barneveld continued: "In my private life there have been so many troubles, and as a darts player you try not to but you take all that with you on stage. "My personal problems got the better of me and I was always catching up to my opponents on stage. (On Thursday) all those emotions came together and I couldn't handle that at that moment." 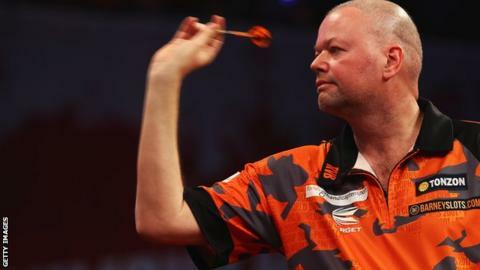 Van Barneveld added that he felt "ashamed" of his performances on stage and "felt he had let everyone down". He said: "I hope people understand the difficult times my family and I have been going through and I need to get my head together. One of the greatest darts players of the modern era, Van Barneveld is one of only three men to win five world titles. He won the British Darts Organisation (BDO) title in 1998, 1999, 2003 and 2005 before moving to the Professional Darts Corporation (PDC) and beating Phil Taylor in the 2007 world final. The former world number one has won 29 PDC titles over his career, including two UK Opens, the Grand Slam of Darts and the Premier League. He also became the first player to achieve a nine-dart finish in both the Premier League in 2006 and the PDC World Championship three years later. Despite reaching the semi-final stage of the inaugural 2017 Champions League of Darts and final of the 2018 Masters, he has struggled of late to continue the form that once saw him challenge the great Taylor's dominance following his switch to the PDC in 2006.